A solid, well-designed keyboard that can protect against RSI and is generally comfortable to use for long periods. It's just a shame about the mouse. You might not think it, with Microsoft's focus on touch-screen controls with its Surface 2 tablet and Windows 8.1, and its love of voice and gesture controls in the Xbox One's Kinect 2 motion sensor, but the Redmond company still has a lot of time for traditional keyboard and mouse setups, and have long been the creators of some very decent desktop kits, of which the Microsoft Sculpt Ergonomic Desktop is the latest. 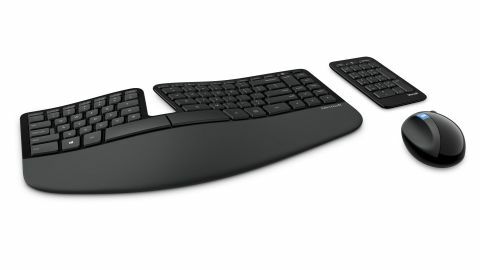 As well as having a fine pedigree in mice and keyboards – the Microsoft Sculpt Comfort Keyboard and Microsoft Wireless Desktop 3000 being two highlights, Microsoft also has enviable experience in creating ergonomically designed devices, and its expertise is evident in the Microsoft Sculpt Ergonomic Desktop. If the word 'Ergonomic' in the name wasn't enough of a clue as to Microsoft's ambitions with this keyboard and mouse set, then the distinctive design will probably clue you in. Named 'manta ray' by Microsoft, the keyboard is partially split just off the centre, with the keys curving towards the gap. The idea here is that the keys are positioned more naturally for where your fingers are, which means they don't have to stretch as much to hit the keys when typing – thereby lessening stress when using the keyboard for long periods of time. It could also – in time – make your typing faster. We say 'in time,' as when first using the keyboard the peculiar layout will probably slow your typing down, and temporarily increase errors if you're typing without looking at the keys. However, with a bit of perseverance, you'll soon begin to feel the benefit of using such a keyboard. The keyboard itself is stylishly designed and well built, with key presses feeling nice and firm, but without too much give – again to lessen strain on your fingers. The keys are also slightly larger than other keyboards to help improve accuracy. As the keys move towards the split they begin to angle slightly upwards towards the gap, which along with a padded wrist rest that runs along the bottom of the keyboard keeps your arms, wrist and hands in a natural and comfortable position while typing. The keyboard and wrist rest can both be altered slightly in height to make it even more comfortable. As well as its distinctive split design, the keyboard's other eye-catching feature is that the numpad, a collection of numerical keys and functions that's often found on the far right-hand side of regular keyboards is completely separate. Looking sort of like a screen-less calculator, and powered by its own battery, the separate numpad is a canny design choice – if you use it often then you can position it for the most comfort, but if you rarely need it then it can be stored away to give you more space on the desk. While the keyboard took a while to get used to, we could see the potential in it straight away, and appreciated the thought process and build quality of the device. The mouse that's included in the kit, on the other hand, is less successful. While it had a similar spherical design to Microsoft's older Natural Wireless Laser Mouse 6000, it was quite a bit taller – again designed to promote a natural shape of your hand and wrist, with an indent to place your thumb, but we found the mouse to be slightly too large and ungainly for our tastes. A shame, considering the success of the keyboard. Both the keyboard and mouse come with extra buttons for making Windows 8 more usable in a traditional desktop setup. On the mouse this is an easily reachable extra button that brings up the Start screen. On the keyboard a number of the keys let you bring up the Windows Charms bar, and the various options that you can choose. If you use Windows 8 a lot, then you'll find these keys very useful. The keyboard is also compatible with older versions of Windows, along with Macs, though of course the Windows 8-specific keys are made rather redundant. All three components of the set (keyboard, numpad and mouse) connect to the PC via one USB dongle, which keeps your other ports free. The Microsoft Sculpt Ergonomic Desktop is a good example of what Microsoft does best. It has a solid and dependable build quality, and a stylish design that draws on Microsoft's experience in creating peripherals. The ergonomic considerations that have gone into this desktop set are evident, and only possible from a company that has spent a lot of time studying that particular area. The Windows 8 buttons might seem like a desperate attempt to make the much-derided operating system still seem relevant, but if you are running Windows 8 you'll find a few of the buttons quite useful. The 'manta ray' design of the keyboard might put you off at first, but its careful design makes working on it for long periods of time comfortable. The build quality of the whole kit in general is also very good, and it also has a stylish design. The fact that the set comes with all the necessary batteries included is a nice bonus, and using one USB dongle for everything is another plus. The keyboard grew on us the longer we used it, but we were less impressed with the mouse, which felt a bit too large to be comfortable. The price of the set is also quite high, though you do get excellent build quality and ergonomic design for your money. If you spend a lot of time typing, and often feel the effects of repetitive strain injury, then the Microsoft Sculpt Ergonomic Desktop really could be a huge benefit to you. While the keyboard might seem intimidating at first, after a while it feels completely natural – and if it saves you from being injured then it's worth every penny in our book.